This is a modified recipe from Breaking the Vicious Cycle. 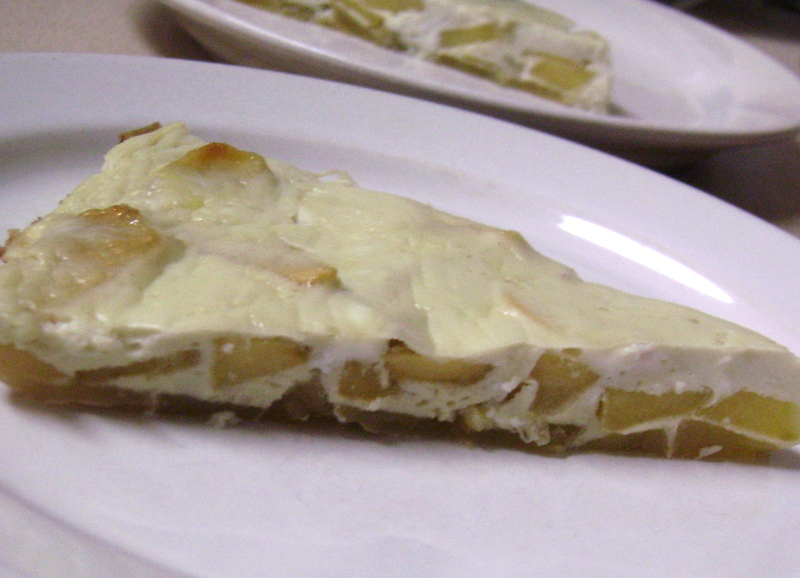 You can use apples or pears, or a combination thereof. Coconut milk (click here for more information) replaces the dry curd cottage cheese as used in the original recipe. The amount of apples and or pears used may be variable depending on the size of the fruit. Simple and easy to make, it’s a nice, light dessert or snack, and it’s also great for breakfast or any other time of the day! Preheat oven to 400ºF. Peel, quarter, and core the apples and or pears and slice lengthwise. Fan out slices and layer in a 9-inch pie plate to ensure even cooking. Lightly drizzle with honey. Bake for 20 minutes. Beat eggs and add the coconut milk. Pour over the fruit and bake an additional 20 minutes or until set. Remove from the oven, cool, and serve. Enjoy! is this the canned full-fat coconut milk? Hi Jessa, yes it’s full fat. 🙂 All my recipes that use coconut milk, unless otherwise specified, use canned full fat. Thanks!